Ever wonder what the greentards really want us to live like? Well, we now have a shining example from Britain. Here’s a guy who lives with no money in a free trailer, grows his own food and even makes his own hard cider. I’d bet the greentards would complain about the trailer though. It probably has wood paneling inside that’s been treated with formaldehyde or some chemical that might make his teeth and hair fall out some day. They’d probably prefer he lived in a cave, much more “green chick” than a pint-sized mobile home. Perhaps he should be wearing an animal hide instead of jeans. Nah, then PETA would get mad. Per the Telegraph…..
Mark Boyle, 31, gave up using money in November 2008. He lives in a caravan that he got from Freecycle (uk.freecycle.org), which is parked at an organic farm near Bristol, where Boyle volunteers three days a week. He grows his own food, has a wood-burning stove and produces electricity from a solar panel (it cost £360 before the experiment started). He has a mobile telephone for incoming calls only and a solar-powered laptop. The trailer does have its advantages over a cave though. No bats, no creepy crawler bugs and if your neighbors are spewing out pollution from their CO2 contraptions like cars, motorcycles, gas lawnmowers, or having beans for dinner (ewww methane) well, you can always move. But wait, if you want to move you’ll have to probably get a truck to do the pulling and spew out that nasty CO2. Oh well, so much for that thought. Woodburning stove? For shame! That’s pumping out CO2 and other assorted pollutants. Perhaps he’s not as green as he appears. You can read the rest of the article here at the Telegraph and see what this guy looks like. I’m sure all the “Earth Mothers” with unshaven legs and braided armpits will fall in love with him at first glance, supermodels will probably look elsewhere. I guess that old song from the early 60’s “Alley Oop” will soon be back in vogue as the official song of the greentard movement. If you never heard of Alley Oop, go here. Regular old-fashioned cremation may be out of style. You can now go out with a wash, spin and rinse cycle. Per this article in the Daily Mail Online. 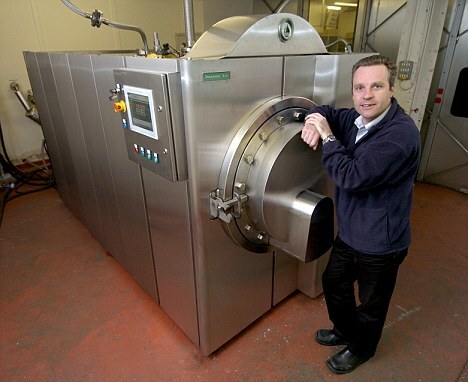 The funeral business in the UK could soon be revolutionised by an ingenious new cremation device which looks like a giant tumble dryer. The Resomator is a green initiative that offers a smokeless alternative to cremation using chemicals to speed up the decomposition process. Each device costs a staggering £300,000 and sees the odd-shaped unit filled up with a mixture of water and potassium hydroxide which speedily dissolves soft tissues and organs. The person’s body, in a sealed internal silk or wool coffin, is placed on a stainless steel shelf inside the metal cylinder and then the chamber is heated to 180 degrees under extreme pressure breaking down the body in less than three hours. Any harmless residue left over is then drained away, leaving the skeleton which is ground to dust ready to be laid to rest. Sounds like they could use this to make Soylent Green to me. So who’s buying these things? They have already sold three of the machines in America and Canada. The Resomator cremation system is legal in five U.S. states with units being delivered to Florida, Minnesota and Toronto in Canada. I really think they missed it with the name and the target market. Imagine had they named it “The Terminator” and marketed it to the Mafia? I bet sales would be fantastic. Just think, poor Guido wouldn’t be out digging holes in the woods in New Jersey or New York anymore. They wouldn’t have to sneak into butcher shops in the middle of the night to grind up bodies. Just keep one of these baby’s in the basement. Talk about getting rid of your problems, this could take that to whole new level! Do they have a heavy-duty cycle for morbidly obese people? Storming your house won’t be the end of it….it’s going to cost you money, too……lots of it..
“Householders could be fined up to £1,000 (about $1,500 USD) if they fail to comply with complex new rules on refuse sorting. Food scraps, tea bags and vegetable peelings thrown into the wrong dustbin could land them with hefty penalties under government plans to be unveiled today,” reports the Daily Mail. Better yet, since the government is brainwashing kids in public schools to keep dossiers on their parents to monitor their consumption and travel habits in order to “re-educate” them for the green dictatorship, maybe the children can be covertly recruited to report Mom and Dad to the local green commissar if they commit the shameful offense of throwing a used tea bag into the black bin instead of the yellow bin. Energy giant NPower also lavished huge sums in advertising expenses to drive its “Climate Cops” campaign, in which children are encouraged to sign up as “climate cops” and keep “climate crime case files” on their families, friends and neighbors. The motto used to be “Blood and Honor”, I wonder if they’ll change it to Blood and Garbage? Mean Green….when you go green you get mean and you justify things according to this article from Guardian.co.uk. Later, in an honour system in which participants were asked to take money from an envelope to pay themselves their spoils, the greens were six times more likely to steal than the conventionals. I think I’ll keep being conventional. I certainly wouldn’t want to be like a green.